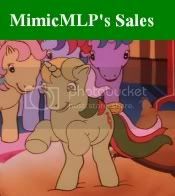 My Little Pony Arena » Forums » Special Interest Groups » The Dollhouse » MH Spectra or Abbey? Forums » Special Interest Groups » The Dollhouse » MH Spectra or Abbey? Posted: 0 Post subject: MH Spectra or Abbey? I want to get one of them but i cant decide which one. Can I see pictures of them without their stock clothing? I just want to make my decision based on their facial features and hair...not the clothing and accessories since ill be changeing those anyways.